With my birthday coming up in a few weeks, I've been browsing the net for some bday bling. Since I'm not a rapper, I can't see myself swinging a blinged out oversized pendant necklace in the shape of a cross or a money sign back and forth. I simply don't have enough street cred to pull it off or the necessary hand/eye coordination skills. So,I want to buy something subtle, preferably in blue topaz, my birth stone. It's not my favorite gemstone, but I'm kind of stuck with it. I'm a huge sucker for big cocktail rings so when I came across Michael Valitutti's collection and saw this art deco cocktail ring my heart swooned a bit. 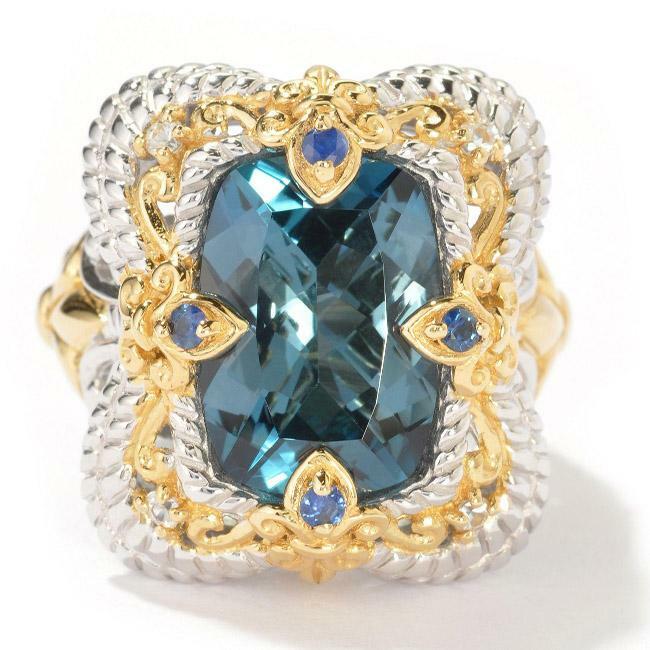 A statement piece in every sense of the word, this two tone London blue topaz and sapphire ring in palladium and 18 karat gold rocks it in uniqueness and decadence! Beautiful ring! I would definitely get that if I were you. I LOVE! Hi! I just found your blog and I'm going to follow you. I love your posts and personal style. I look forward to your future posts! I can't help but lust over this beautiful ring! Unfortunately, I know I couldn't afford it. I think I'll have to sell gold for cash just to be able to get a beautiful ring like this. Really it's an excellent ring. Thanks to share.